For a human today, death is a natural phenomenon and while not desirable, is fully explainable. Anyone has a fear of the end, but the reason makes that today we see the death as an event, not as a being. Only children represents the death as a character, a being that comes and causes the end of life of a human. However, the representations of death as a character are not gone – they continue to live through painting, literature, filmography. The fact that most children personifies death is significant: children have a so-called “magical thinking.” They see and understand the world around attributing human qualities to inanimate objects . They can represent certain realities personifying them, thus bringing them closer to known, to themselves. Similarly, people over time have personified death to make it less known, less incomprehensible. Death becomes a nearest human character, even frightening. In ancient times, death was seen as natural and inevitable, without having itself an evil character, hatefully. Many ancient peoples represented their death as a female character, often very attractive, which comes in the form of a beautiful woman. Sometimes it is, on the contrary, a very old woman, the image being present in the romanian culture too: the old woman with scythe or the lady with scythe . The ancient Greeks represented their death as a natural way, so they didn’t had frightening images of the character . Life and death were imagined as coincidence oppositorum idea – united opposites; life had feminine attributes and death had male . In their mythology, were Thanatos and Hypnos brothers, the first god of death and the second god of sleep. Thanatos ruled dead in the other world and was personified as a young man wearing a flame torch extinguished (had wings in many pictures, as the angel of death). In Judaism, Islam and Christianity, traditions speak about the angel of death, is portrayed as a man with wings or in fierce forms as a diabolical creature (some pictures represent a creature with hundreds of tongues and eyes). With the great religions, death begins to have a more menacing character (death is the moment in which you will be judged). 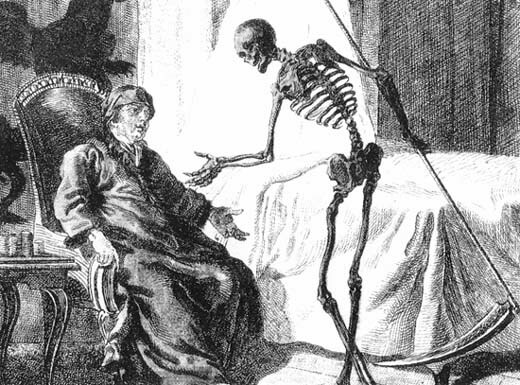 The personification of death as a terrifying creature, known as the skeleton image has its origins in the terrible plague time of the Middle Ages. Death became terrible, it was everywhere, so that were born new images to represent it. It should not surprise the medieval macabre imagery, given that the population was exposed to reap the terrible plague of the dead sight. The keleton image that comed to you and reaped you became universal (the skeleton was often represented without clothes, less decomposed, and finally wearing a shroud or a black cloak). That time artists have created an image that remains in history: macabres dances of death, with the skeletons getting out of their graves and dance with the living ones (no one can escape this dance). Thus remained in culture the personification of death as a skeleton wearing a black cloak with a scythe. The picture was somewhat different – sometimes the face not seen at all, sometimes being a decomposed face. The point, however, the hooded black cloak and scythe, still remains present in the personifications of death (reaper, , the famous “The Grim Reaper”). In some medieval images the character does not hold, however, a scythe, but a bow and arrow, a watch or hourglass. The personifications of death are influenced by how to represent the end of the people, death was in turn seen as a natural phenomenon, inevitably, or as something terribly dangerous, a harm that must beware, of which you should run if you can.